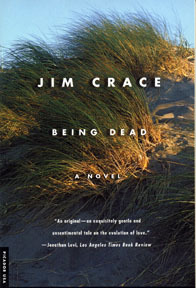 Jim Crace. Farrar, Straus and Giroux, New York, 1999. Now heres a wierd book. As the novel opens, on a remote beach in mid-afternoon, Joseph and Celice, married for almost thirty years, lie murdered in the dunes. The novel then goes both forward and back in time, at turns grotesque (as the bodies decompose, he treats us to a detailed biology lesson on the process of decay) and hauntingly beautiful. The novel is not a murder mystery, but rather a reflection on love, death, and mourning. As I learned more about Joseph and Celice, they become more than just bodies whose lives are over — I truely grew to care about them. Only a very courageous novelist would frame his analysis of the evolution of love with a dissection of the proces of death. A remarkable, georgeously written book that I cannot recommend highly enough. Easily the best novel I read last year.